Party wear lehenga choli is a glamorous dress worn by women in India. It is composed of a long, pleated skirt and a choli, a tight fitting upper body garment. A party wear lehenga is secured at the waist while leaving the back and midriff bare. The choli is cut in a way that fits the body tightly and allows the exposure of midriff and navel. A lot of exquisite embroidery work is done on a lehenga and it is one of the most popular outfits worn by women in India during festivals, weddings, and parties. The lehenga choli is one of the most important ethnic wear garments whose popularity has increased exponentially in the present times. It is available in a mixture of colors and patterns which gives it a unique and exotic look. Lehengas are also very unique as they represent an amalgamation of diverse cultures of India and are worn by women across the Indian subcontinent. A designer party wear lehenga is an extremely ravishing, elegant and glamorous form of attire, which is bound to woo one and all. It is a well-known fact that designer party wear lehengas which are available in the market belong to varied price range. The major reason for price differentiation is the thread work, which is done in gold sometimes and that increases the overall cost. In order to decrease the overall price, one can opt for silver thread work instead of gold. 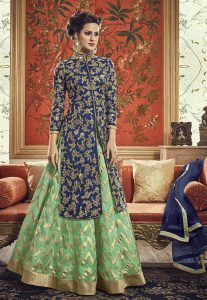 Latest party wear lehenga designs which do not include gold thread work are in no way less attractive than the ones which do; the look of a simple, subtly decorated lehenga is in fact preferred by women when they want a simple yet chic ensemble. Designer party wear lehenga choli can be made from different varieties of fabrics. Chiffon, silk, satin and crepe are best suited for party wear lehenga sarees. 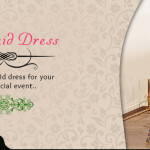 The ideal fabric for the dress in summers is chiffon and georgette. Sheer and other transparent fabrics add glamor to the dress, provided they come with an opaque lining in the right places. Party wear lehenga designs include embroidery done by using threads of contrasting shades which looks extremely gorgeous. Richly embroidered, sheer cholis go really well with crepe lehengas. Other embellishments which give an exotic look to the dress can include sequins, Kundan work, metal beads, glass beads, pearls, crystals etc. The colors in fashion change every other season, but at the same time certain color combinations and trends can end up defining a generation and in the past few years, a trend which is here to stay, is that of color blocking. Color blocking is implemented in party wear lehenga choli designs by making the colors of both parts of the attire, complementary rather than matching. Sometimes an ornately patterned choli is balanced out by a relatively plain lehenga and vice versa. Another popular trend is of using bright neon colors and shades of black, gold and red. Compared to traditional sarees, draping a party wear lehenga saree is relatively simple and hassle free procedure. This easy to wear garment only requires women to slip into it. Latest party wear lehengas are stitched as long flared skirts with a zip at the side. As the dress is made according to the measurements of the wearer, she just needs to slip into it, fasten the zipper and drape the pallu over the shoulders. A lehenga is a perfect solution for women who are not comfortable with the elaborate draping and pleating of a regular saree. Then there are body-hugging skirts which emphasize the curves of a woman’s figure and give a stunning and charming look to the wearer. Certain vintage styles like the voluminous circular ghaghra and the paneled lehengas have also made their comeback in the modern fashion in a big way. In terms of cholis, the most glamorous and fashionable options are the corset style blouses, that end just above the navel. 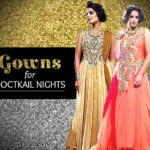 Parties and weddings are the perfect places to flaunt backless cholis, deep neck cholis and halter neck cholis. Flowing dupattas add the perfect ethnic touch to complete the outfit. For parties, the dupattas can be arranged in unconventional fashion, like around the wrists or from back to front. Indian jewelry pieces such as Polki earrings, mang tikkas, nose rings and bangles can add the requisite touch of ethnic glamour to a party wear lehenga. 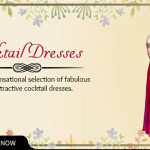 Cocktail Dress Ideas – Way Too Good For Gala Affairs!